Sunflowers grace my dining room table most days in summer, their bright faces a welcome addition to the ambiance of any meal. Plus, unlike some others around the table, they don’t give me any lip about the no-cell-phones-at-the-dinner-table rule. This year, local sunflowers are also making an appearance on my table in a second, more roundabout way. 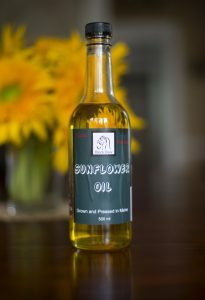 I’ve replaced my olive oil habit with a bottle of Yost Farm’s Black Bear sunflower oil, cold-pressed in Blaine, Maine. Last winter when I was lamenting the lack of a local option for a cooking oil I could both drizzle over salads and glug into the sauté pan, I stumbled upon Aroostook County farmer Tyler Yost’s plans to press Maine’s first – and to date, only – local cooking oil. He had on his hands a glut of non-GMO sunflower seeds because a Vermont-based oil producer he’d grown them for, Full Sun Company in Middlebury, had shuttered its pressing operation. Sunflower oil cold-pressed in Maine under the Black Bear label. Last February, Yost was still working out the kinks in his cold-press operation and learning how many pounds of these black seeds it takes to make a gallon of oil. By May, he’d determined that ratio to be 25:1, started bottling the oil under the Black Bear label and peddling it himself to Maine chefs; public institutions, like the University of Maine system, with mandates to buy a certain percentage of Maine food products; and stores like Bow Street Market in Freeport and the Portland Food Co-op. I picked up my 500-milliliter (16.9-ounce) bottle at Bow Street for $10.99 and have been using it with a liberal hand in my summer vegetable cookery. The taste is nutty to start, the mouthfeel more creamy than slick. And the flavor that lingers is a slightly more peppery version of whatever other food you’ve served it with. I’ve tried it on raw tomatoes, blanched green beans, shaved fennel and citrus salad, steamed Maine grains and lettuces too many to name. Chef Luke Korzekwa at Café Sorpreso in Presque Isle uses a 50/50 mix of Black Bear sunflower oil and imported olive oil whenever he sautés. He’s so pleased with how the local oil performs in the pan when exposed to high heat and how it complements a wide variety of ingredients on the plate that he plans to switch over to it completely for sautéing. Yost says the hardest part of bringing his new local product to market is getting people to open that first bottle. “But the most rewarding part is their positive reaction when they do. That’s fantastic,” Yost said. “I was really excited to find a local cooking oil!! And sunflowers. I’m a sucker for any flower,” chef Devin Finigan said. 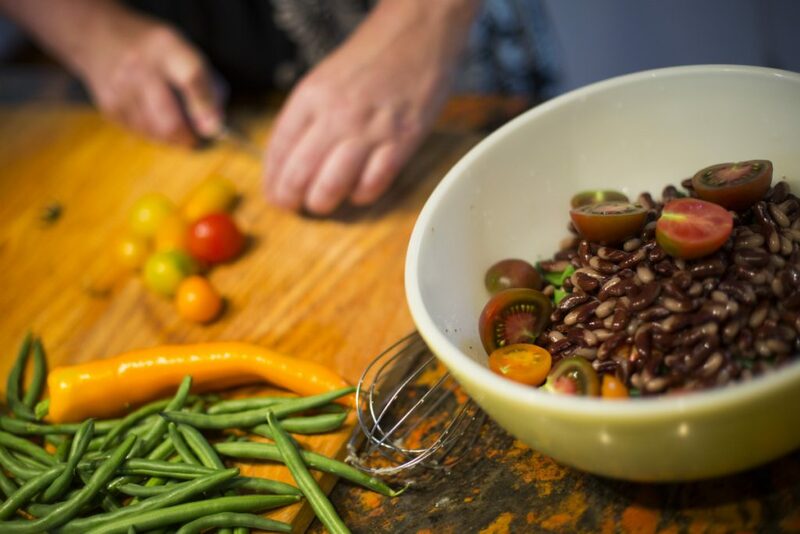 At Aragosta in Stonington, she has featured Black Bear oil on the menu with a smoked tomato salad and also used it to sauté local halibut with sweet peas. Finigan prefers to cook with the oil as its nuttiness is elevated and the slight bitterness she tastes in the raw oil dissipates. Another big fan of Black Bear oil is potential competitor Tristan Noyes. He’s the executive director of the Maine Grain Alliance and also operates the GROMAINE Farm in Woodland with his brother Jon. The brothers have worked with researchers at the University of Alaska to pinpoint sunflower varieties suited for colder climates. They have planted three varieties and hope to harvest enough seed to process (using Yost’s press, as he’s graciously offered) into oil next fall. Noyes said they will make a decision on which seed to run with once they better understand how many seeds it takes to fill a bottle of oil. In the meantime, Noyes is hawking for Yost, telling friends and colleagues just how good the Black Bear oil is. He’s not worried about Yost getting a corner on the local oil market in Maine. “There is plenty of room for anyone who wants to participate,” Noyes said. The moral of this little green eating tale is: good local things come to those who keep asking for them.